2014 Mini Paceman John Cooper Works ALL4 review | What Car? Mini is giving its two largest models, the Paceman and the Countryman, a summer refresh for 2014. To find out if this brash mixture of hot hatch, coupe and SUV has mellowed over time, we tested the Paceman in range-topping John Cooper Works (JCW) trim, with a full-fat 215bhp engine and standard all-wheel drive. It's a shame that this was the only car available to try, as the JCW model takes up just a small fraction of overall sales, with most buyers opting for the more sensible (and considerably less expensive) Cooper D.
Although there are few mechanical differences to the 1.6-litre turbo engine or six-speed manual gearbox, tweaks to the internals, and smoother aerodynamics on the outside mean a slight drop in CO2 emissions, which fall from 172g/km to 165g/km. The claimed economy now nudges towards 40mpg, too. 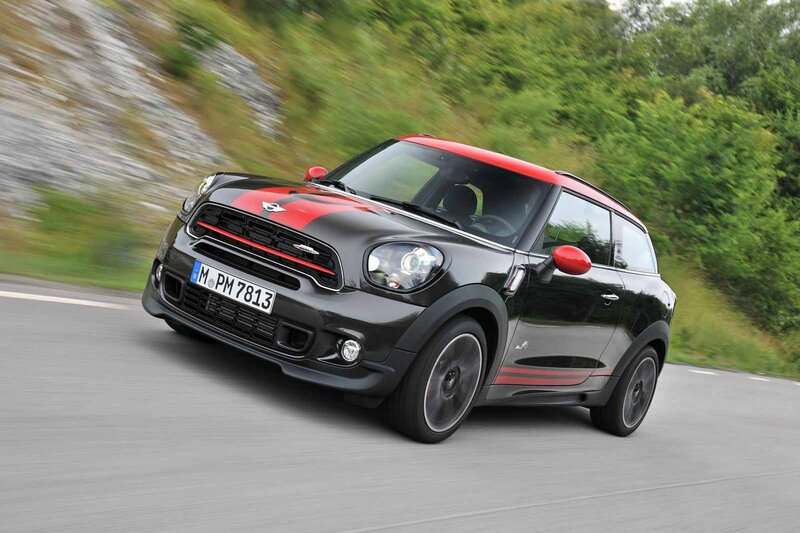 **What is the 2014 Mini Paceman JCW ALL4 like to drive? **At £29,440, the flagship Paceman is bang-on the money for hot hatches as talented and varied as the Volkswagen Golf R, Renaultsport Megane and BMW M135i. True, only one of those cars (the Golf) offers four-wheel drive to match the Paceman, but all of them can rightly claim dynamic superiority over the JCW. Unike the John Cooper Works hatch and coupes, the Paceman really does feel hampered by its tall ride height and heavy body when you drive it quickly. In its higher state of tune, the 1.6-litre turbo engine actually sounds a bit better and revs more smoothly than it does in the Cooper S. The JCW can complete the 0-62mph sprint in a respectable 6.8 seconds, 0.1 seconds faster than before; it's quicker to respond in gear, too, but well short of the kind of firepower you'd expect. There is a decent amount of grip, and you can throw it into corners and the Paceman will cling on gamely, admittedly with plenty of body roll. Take liberties in tight corners, or get greedy with the throttle, and it will still scrabble for traction and set the orange stability control light flashing though. The steering is fairly heavy and quick to respond, even in 'Normal' mode. Select 'Sport' (which also sharpens up the throttle response and induces a popping burble from the exhausts) and it gets weightier still, but the Paceman can still feel twitchy and nervous at higher speeds. Road and wind noise are a both significantly above acceptable levels, even for a hot hatch, and those standard 18-inch alloys and the stiffly sprung suspension (the Paceman sits 10mm lower than the Countryman) do the JCW no favours on rough roads. Hit a big bump and you'll feel a nasty jolt through the cabin. **What is the 2014 Mini Paceman JCW ALL4 like inside? **Inside, the revised Paceman is near identical to the Countryman, but there have been some changes that eagle-eyed Mini enthusiasts will be able to spot. The dark grey dials of the JCW are now fitted to every Paceman, so to help distinguish the flagship, there are new JCW logos in the speedo and rev-counter. New chrome highlights on the air-vents make a first apperance, and as befits the top-of-the range car, the JCW has its own unique cabin elements, with gloss black and red plastic inserts along the upright centre console, and in the doors for a sportier look. Yet, frustratingly, the same old problems remain. If you drop the seat too low, then your view of the passenger mirror is obstructed, and visibility in general is worse than in the Countryman, thanks to the low roof and small rear window. The front seats aren't very supportive, either, and are difficult to adjust. In the back, things are even worse. You get two fixed seats as opposed to the sliding bench you'd find in the Countryman, although the tapering roof robs you of headroom. The cramped conditions make the Paceman less practical for carrying passengers than the majority of five-door small cars – not a character trait you want in an SUV. The quality of the cabin also leaves a lot to be desired. The dash and air-vents are covered with hard, unyielding plastics, and while the majority of the buttons and switches are well-damped, the retro design is fiddly, with small, hard to reach buttons, some of which are blocked by the gearstick. We'd struggle to recommend the Paceman JCW to anyone. Its harsh ride, cramped and poorly designed interior, small boot and astronomical price all make it the weakest car in the range. If you want a fast, four-wheel drive petrol Mini with space for all the family, then go for the Countryman Cooper S ALL4 instead. It's bigger, cheaper, and fast enough. Looking outside the MIni range, there are any number of hot hatches which have more power, sharper handling and roomier, classier cabins, all for similar money.